#16 Done – I Grow, Girl! Told you I had some things crossed off The List to share! I’ve been working on #16 since last Sunday, when I got my first little tomato seedlings into their pots, and yesterday I got the last of my purchased transplants settled into their new soiled homes, so I can finally call #16 – planting a container garden – done, done, done! Well, as done as it can be. If I’ve learned anything about gardening it’s that even small-scale planting can be extremely addictive, so I went as far as my modest budget would allow, and already have big dreams for next year. Summer Winds gift cards are my new best friends. It’s a good thing though, really, having to keep things simple. Not only am I having to get creative about finding/upcycling budget-friendly supplies (always fun), but friends have been so generous, sharing cuttings and excess plants, it’s been amazing. Plus, I’m not known for my ability to keep green things alive, so I’m looking at this year as a bit of an experiment; I live in one of the best areas in the world for growing my own food, but I don’t yet know what will work in my space. It’s a small space – our HOA calls it an atrium – and only half of it gets full sun, the other half partial shade. So I’m trying things out and (grudgingly) keeping it simple, so that I’m not sinking a boat-load of skrilla into something that I may end up killing. But so far they’re all growing! Thriving, even! 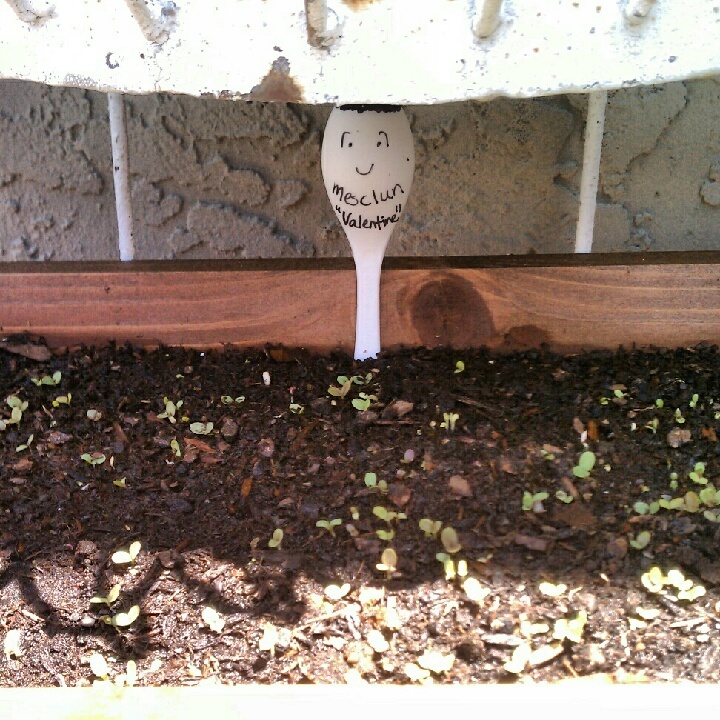 I can’t wait to show you what I’ve got growing – me, Black Thumb McGee – so let’s have some pictures, shall we? I’ve actually got two of these tubs going. 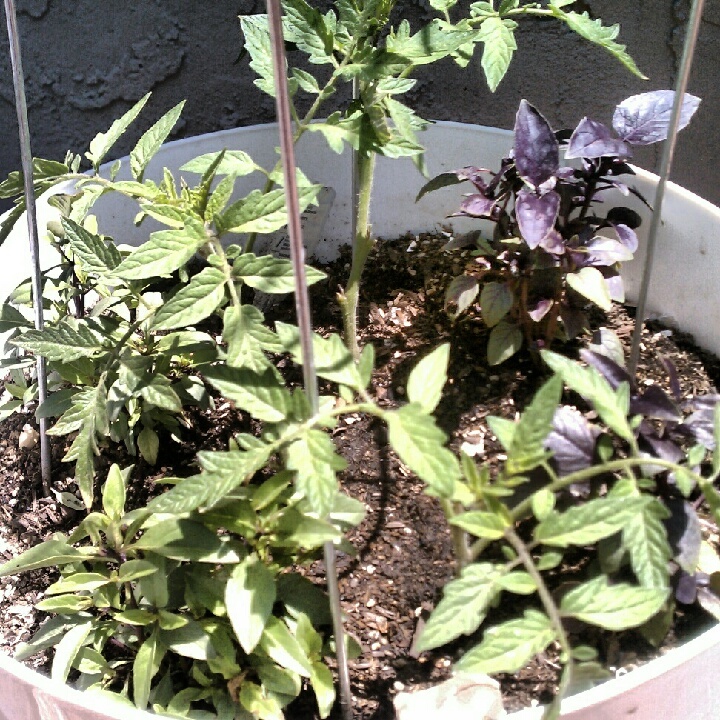 One has (I think) two Roma tomato plants, and this one has three of some other kind of tomato. I forget the type. 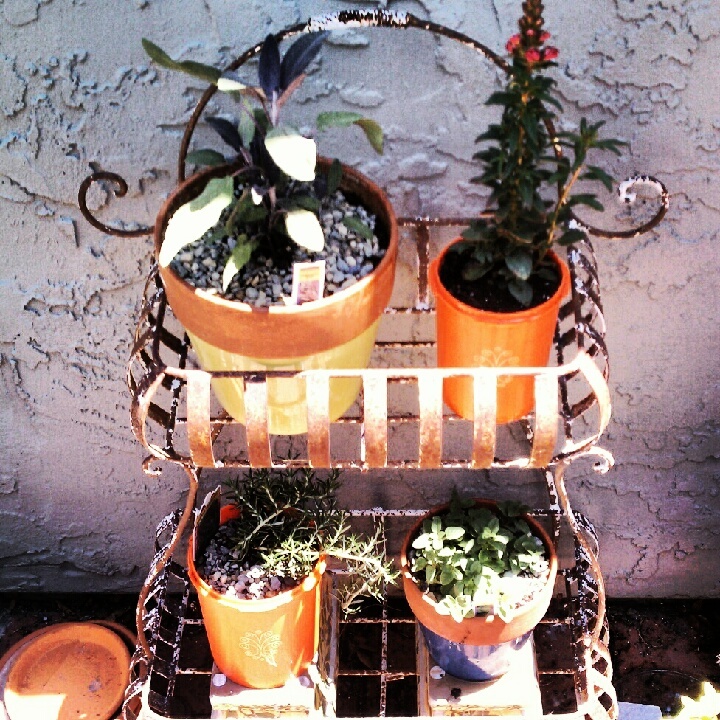 My friend Ken, father to my good buddy Kedrick, gave me five plants, and started me off on my container adventure. I put the tubs on those cool little stands with wheels so I can easily move them about to follow the sun. Since I read in all three You Grow Girl Books (my new bibles) that tomatoes make great companion plants, so I planted little basils I got from Whole Foods on top. 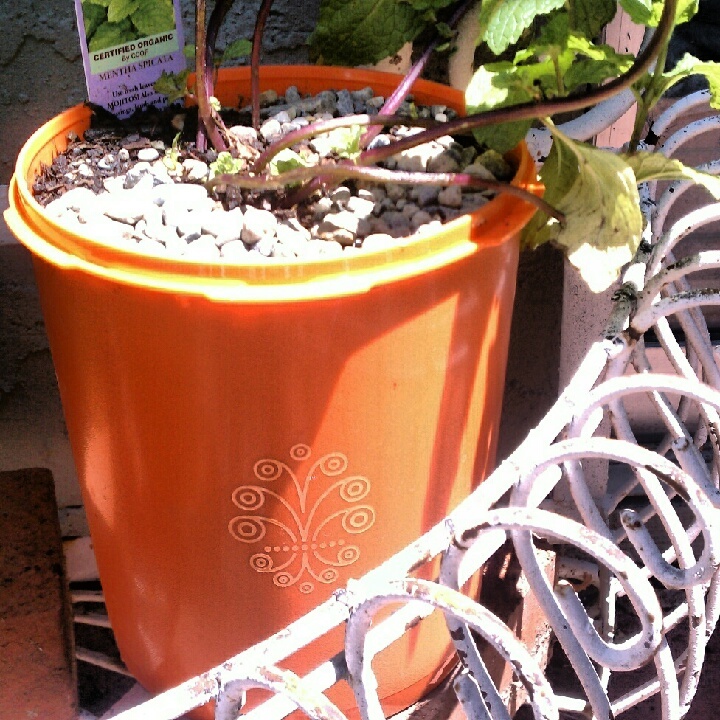 This planter has two purple basil plants and two Thai basil plants. The other has four sweet basils. I’m a little worried that I crowded the container, even though they are the size of medium trash cans, but the tomato plants seem to be doing well so far. They’ve grown at least an inch and a half since I pinched off a third of their growth, and have nine buds between them. That’s a good sign, yes? Anyone who knows more about tomatoes than I do (not hard) feel free to chime in! This is my small planter. I got all my plant furniture and a ton of pots from my dear friend Jan three years ago when we moved into our house, and I’m so glad I finally get to make good use of them! 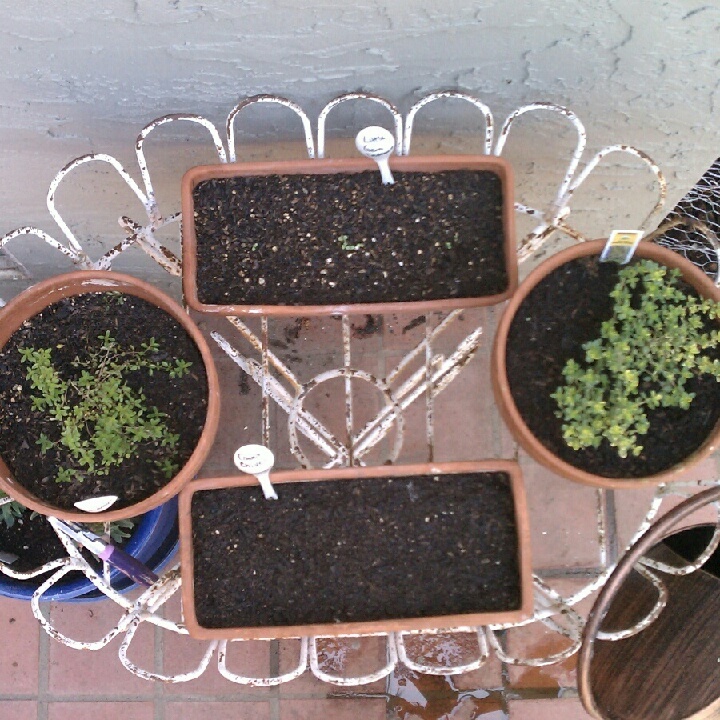 Clockwise from top left: purple sage (which I hear gets huge!) Sonnet snapdragons that are coming up a fiery orange and fuchsia, Italian oregano, and creeping rosemary (no towering bushes for my little space, thanks!). I just read that steeping rosemary in hot water helps headaches. Which I get. A lot. And I hate taking medicine. So that’s a win! 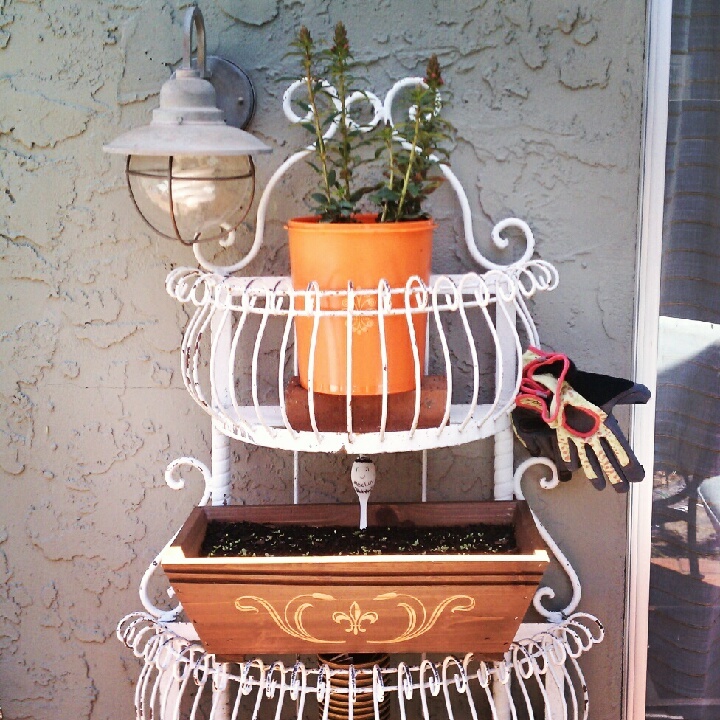 This is the top of my tall planter. When I have more resources I want to make the most of their deep baskets and line the tiers with landscaping cloth and put hanging plants like cherry tomatoes and strawberries in them. But for now, it’s doing a good job of holding up my containers. Snapdragons on top and mesclun lettuce in the wooden planter. They just started popping up! I know it’s a little late in the season for lettuce, but I’m planning on plucking these when they’re small and tender for a baby lettuce salad. As I said, it’s an experiment. Bottom tier of the same tall planter. This is my herbal tea level. 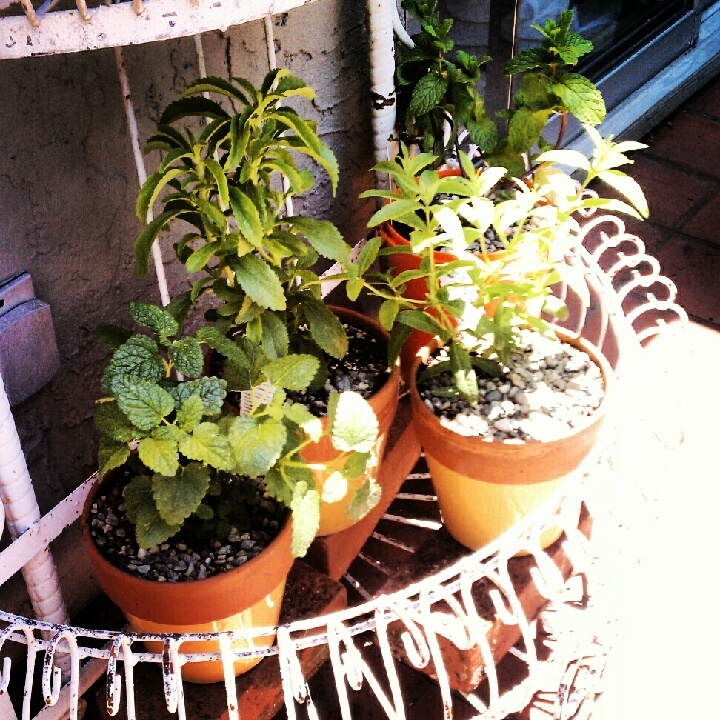 Clockwise from bottom left: lemon balm, stevia, mint, and lemon verbena. Did you know lemon balm helps upset stomachs when steeped? I didn’t! I’m definitely planning on making some tea blends to warm me through the winter, but I also see some more granitas in my future. I hear lemon verbena is a winning flavor in more than tea! Did you notice all those spots of orange among all the normal pots? Those would be my second favorite thing in my garden! I never realized how expensive pots and garden accessories are, never having had much use for them before. So two days ago I went to my local Goodwill to see if there was anything I could upcycle into pots. I found this mint condition nesting set of vintage Tupperware, registered trademark. I drilled some holes in the bottom, and bam! Kitchey-cool containers! If they were a different color I’d totally have them on my kitchen counter, but they’re a not-kidding-around shade of orange. Which is perfect against my drab grey walls (HOA chosen) with bright green trailing out of them. I am in love with the iconic swirl design. They all had their lids, too, (classic Tupperware sunburst-style, straight from my childhood) and I haven’t decided yet if I want to use them as stepping-stones when I plant in the ground or make a found object wind chime. And did I mention they’re in perfect condition? Well, before I poked holes in them, that is. The best part? The set of four was only $7.00. I went to another Goodwill today looking for things to make a bird bath and found one single large matching container. It was totally beat up, no lid, and labeled $6.99. Um, I don’t think so! I already scored a great deal, thanks! So. In. Love. 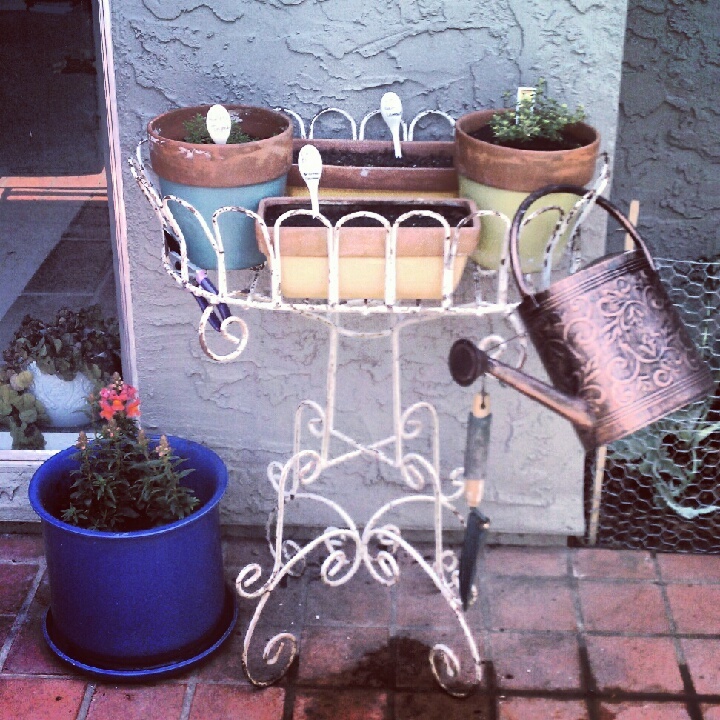 This is the small stand planter, on the wall between our living room window and our bedroom’s sliding glass doors. I totally underestimated how many snapdragons I could fit in my Tupperware (registered trademark!) and had no where to put three of them, but luckily I had this gorgeous glazed drum pot from Jan. I’d intended to use it for something else in the future, but I really like the snapdragons in it, so I’ll keep them there for now. It looks like a lot of dirt, but I see sprouts! Clockwise from top: little gem lettuce starting to poke it’s heads through the soil (hey, I know it’s Summer. I said I’m experimenting. ), lemon thyme, chives that I seeded three days ago so still has a ways to grow, and regular thyme I got from my dear friend Danielle. Yes, my garden is a product of the work of many hands. Every time I look at all the things given by people I love, I feel very happy. A baby globe artichoke plant! Ahhhhhhhh! I love artichokes. I mean, I LOVE artichokes. And there’s no better place to grow them in the States than the California Bay Area. When this baby gets big I should be able to harvest around 30 artichokes a year. Because they’re a year-round grower in my area. Yeah, baby! 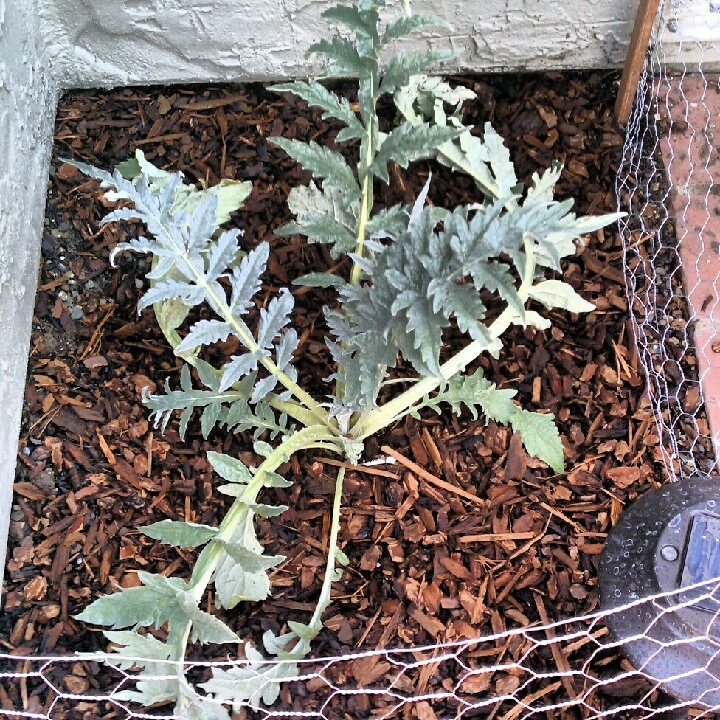 So the chicken wire…yeah, artichokes need a lot of water and fertilizer. I’m working on an organic garden, so my fertilizer of choice is a fish and sea kelp emulsion. Which made my dogs go crazy. As in, they tore the first artichoke I planted apart within five minutes while I was in the shower. You’ve never seen such muddy prissy city dogs. They both got baths of shame and a thorough scolding from A. Even though I was at my garden budget with the first artichoke, A told me I could get a second one. So I wasn’t taking any chances. A erected a fence for me as an anniversary present. Hey, everyone has their own idea of romance. Mine is the promise of future artichokes. It’s the prettiest little ugly plant ever. Last but not least, these little greens are on my kitchen windowsill above the tomatoes. I’ve bought microgreens for years at the store, so you could imagine my surprise when I discovered I could buy enough seeds to plant ten pots worth of microgreens for less than the cost of one container of sprouts from the store. I figure that if all else fails, these will not. They’re pretty idiot-proof, since you cut them down before they actually grow into anything. 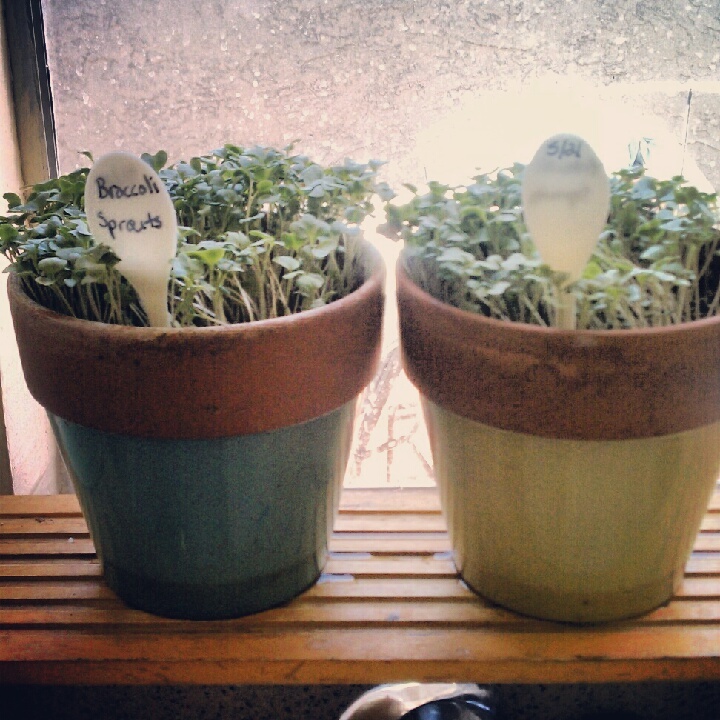 These are broccoli sprouts, soon to be joined by clover and radish sprouts. These are just now ready for harvesting; I thought that I could try planting other varieties two weeks apart, and A and I could have home-grown microgreens for the whole Summer. So that’s my container garden! I have lots I want to do, but I’m very happy for now. And there will be more than a few How Tuesdays coming up featuring the bounty of my little containers. In a few months I’ll be ready to split my artichoke (it’s best done young) and I am still enthralled with adding pieces of friend’s gardens through cuttings or splits of interesting plants and flowers. So if you’re in the area and want to share plants, let me know! What’s growing in your slice of the world? Good for you! a great organic fertalizer is made by Dr Earth. I love you plant racks too!